You’re not a foodie if you don’t know the name Guy Fieri. You are not a foodie if you haven’t watched an episode of Triple D (Diners, Drive-Ins and Dives).. Yeah, you know that “Guy” that hosts Guys Big Bite, winner of the first season of The Next Foodnetwork Star. He may know how to eat but does he really know how to cook? I mean, anyone can basically tell you what tastes good. We visited Northern California one weekend and one of his restaurants in Sacramento, Tex Wasabi, was on my list to try. For starters, we ordered the calamari (not pictured-$10.95), garlic fries ($5.95), and the red dragon roll ($13.95). We had to order the calamari because the description said “some of the best calamari you’ll ever try.” By itself, the calamari was bland. It was fried nicely but it had way too much breading. What made it good was the thai dipping sauce that came with it. So it should have described as the "best calamari dip you'll every try." The garlic fries were really good. The fries were crisp and the generous mixture of the chopped garlic, parmesan cheese, salt and chopped parsley was perfect. I couldn’t stop eating these. The Red Dragon roll is a California roll topped with spicy tuna and rolled in tempura bits. Although there was nothing special or different about this roll, I really did like it. The unagi sauce was also very good. I guess Guy knows his sushi rolls. Ed and I shared the Oyster Po-boy sandwich ($13.95), “Fresh oysters dusted in seasoned cornmeal flour & fried.” I was really disappointed with this dish. Although the flavor of the spread was good, the oysters that were used were so small. They were so small so you couldn’t taste much of the oyster over all the breading. So with the thickness of the French roll, the lettuce, and the dressing, you wouldn't be able to tell what kind of po-boy you were eating. For dessert we ordered the chocolate bread pudding a la mode. 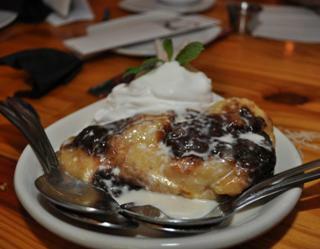 I’m not really a bread pudding kinda gal, but for some reason, this was the only dessert that really appealed to me. I’ve tasted bread puddings before that were just mushy. This one was really good! It had the texture of a freshly baked, soft, fluffy cinnamon roll that was drenched in sauce and there chunks of chocolate in some bites. It came out warm and it melted in my mouth. It didn’t need the ice cream, but I do like eating warm desserts with that cold contrast of the ice cream. Don’t expect gourmet, don’t expect a hoity-toity atmosphere, and don’t expect extraordinary food. Although he is a pleasure to watch, the food at Tex Wasabi was just ordinary. I wouldn’t recommend this restaurant to anyone who wants to have one of their best meals of their life but would recommend it to those who live in that area who want to just hang out with friends and listen to the live band while having drinks and appetizers. Oahu Shave ice is located in Fullerton, CA. I was excited to know that I no longer had to chase trucks or save a wad load of cash to take a trip to Hawaii to get "authentic" shave ice. We visited Oahu Shave Ice to taste if it measured up to my favorite shave ice truck or to my wonderful experience in Maui. I got my usual order: large shave ice with strawberry and vanilla syrup, mochi, condensed milk and vanilla ice cream. Let me just make this short and sweet. It didn't measure up, nor was it even up to par. Parts of the shave ice were still chunky that you can hear the breaking of ice in your mouth. The bottom half of the ice didn't even have syrup. I'm not sure what brand of ice cream was used but it didn't taste like homemade, quality ice cream and the mochi either hardened in the ice or was already hard. Everything about it was definitely not authentic. I usually share a large with Ed and together we always finish it. This time we didn't even make a dent. Let me make this short and not so sweet. I would not recommend this place at all. Besides the service, nothing else was great.